The Workers’ Party presidential candidate, Fernando Haddad, released a letter today, on the eve of Brazil’s elections, to thank and encourage those who support his campaign. “We are brothers and sisters as we dream of and hope for a fair, sovereign Brazil,” he wrote. Brazilians will vote tomorrow for president, governor, and federal and state representatives. In case no presidential and gubernatorial candidates win by majority, a runoff vote will be held on Oct. 28. First and foremost, I want to thank you for your courage, joy, and confidence. You are making an extraordinary thing: you are making a great part of the people see me through your eyes and feel fondly about me just like [ex-president Luiz Inácio] Lula [da Silva] feels about each and every one of you. We are brothers and sisters as we dream of and hope for a fair, sovereign Brazil. You, more than anyone, know that our path has never been easy. They have unfairly convicted and arrested our president Lula. They do everything to stop our message from getting to people. They campaign basically through lies, all hatched in the underground, because they do not have the courage to face the democratic conversation in broad daylight. Their ideas are driven by brute force, while our strength comes from our ideas. But don’t be intimidated and don’t respond to provocation. No matter what they do, we will never lose hope, because we know we are not alone. Our struggle is not about ourselves, but about the millions that our administrations lifted out of extreme poverty, making sure they had rights and opportunity and were respected as citizens. These people, the majority of Brazil, will always be with us as we are with them. They are the dream of a better Brazil, which Lula taught us it was possible, which is what gives us the strength to fight. Right now, every vote matters: every conversation, every piece of campaign material and good news that is shared, as well as every answer against lies. It’s time to stay alert. Now it’s [time to get to] social media and the streets, to consolidate our place in the runoff vote, to fight together, once again, for the future of our country. All polls show we can go into the runoff, and then we will make it even clearer how different the two projects for Brazil are. The majority of the Brazilian people rejects the project of intolerance and end of the people’s rights. Hope has won over fear once. Now, it will defeat hatred and lie. 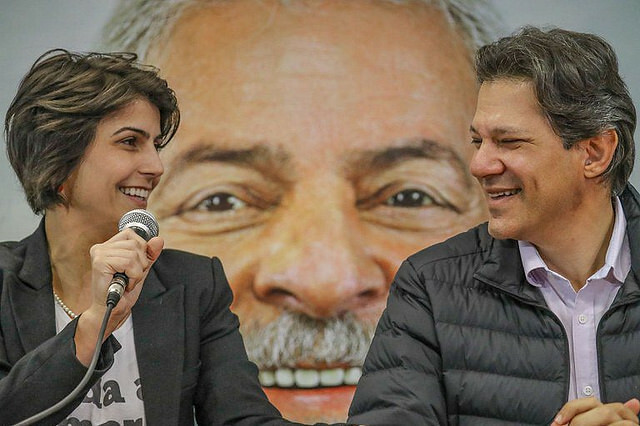 I, Manu[ela D’Avila, Haddad’s running mate], and president Lula count on each and every one of you. I have faith that, together, we will win the elections and bring the presidential office back to the people. Believe when I say that the Brazil we have built still lives in the memories and hearts of Brazilian men and women. And the Brazil of the future, where we will celebrate fraternity, tolerance, democracy, and peace as siblings, and where we will have joy and security to raise our children and our families, proud of all colors, faiths, and differences that make this the best country of the world – that’s right there in front of us. Brazil will be happy again. With your strength and courage.